Last Friday, I hopped along to PRIA’s annual Women in PR lunch at Zinc in Federation Square. The hot topic for the day was social media, particularly the business of being social. Annie Baxter, Google PR Manager, Australia and New Zealand. Mandy Solomon shared her research into new trends and emerging web practices. She got everyone thinking about the buzz caused by online games such as Farmville on Facebook, and how they fit in the social media picture. Did you know there are more than 20 million active players daily? Daily!! Mandy explained that our online digital persona is becoming multi-dimensional, and one of the results is more people wanting to play social games. Furthermore, online social games are starting to become profitable. Games like Farmville hook people and then sell them goods to broaden the experience. And it’s not just business benefiting, charities are jumping on board too. So it’s no surprise that Facebook is developing its own virtual currency. It has been estimated that last year alone it made $10 million in the beta testing phase of its virtual currency. This pails in comparison to its advertising revenue, however it’s very much in its early days. Next Gay Flashman used case studies to show how social media can and can’t work for you. Gay demonstrated how well Huggies engages online with a subtle sell and by trying to build a community. She also used the Domino’s Pizza YouTube episode as a reminder of the changing nature of reputation management in the age of social media. Gay told eager listeners the best way to engage with people on a website is to add value. Her other advice: be prepared to lose control and be open and honest about negative comments. She finished with her Flashman Fundamentals: Prepare, Monitor, Engage, Measure. A lesson for us all. The final speaker was Annie Baxter from Google Australia and New Zealand. Annie talked us through Google’s foray into blogging (which makes sense when you purchase one of the world’s first blogging tools), and how they moved onto Twitter in 2009. She explained how they use Twitter to solicit ideas from people. Her final piece of advice was not to bet against social media, because it’s where we are going. What an impressive line up of speakers willing to share such valuable information. Thank you ladies! Proceeds from the event went to the Lighthouse Foundation, and their ambassador Stacey Currie delivered a moving speech about her experiences and the new New Mothers’ Club for homeless Mums and Bubs. Finally, congratulations to Marnie Kane from RMIT for winning the Merle Howard Prize. PS. If you haven’t seen Glee’s remake of Madonna’s Vogue, check it out below. We’re knee deep in evaluations at the moment – wading through a sea of metrics, news clippings and feedback. Along the way, we’ve discovered some amazing results for a social media campaign we developed and implemented for Run for a Safe Climate. Evaluations are a reflective process – a chance to step back and take stock of your situation. A good evaluation is like a good holiday, essential but often neglected because work gets in the way. •	set benchmarks against which the effectiveness of strategies, tactics and practices can be measured. So what’s the difference between a good evaluation and a bad one? There are a number of factors that make an evaluation worthwhile. First a good evaluation relies on honesty, second it’s about scrutiny; looking at the project or campaign from different angles and through many different lenses, third a good evaluation takes time and fourth an evaluation should be timely. Why is honesty an essential part of the evaluation process? Well, there’s no point going through an evaluation if you’re not prepared to accept the reality of the situation. If you’re going to dismiss negative results or findings, then there is no chance you’re going to learn from the process. Also if you sugar coat the information and don’t tell the whole truth and nothing but the truth (oh god having a Boston Legal Flashback) then you won’t discover what went well and what went wrong. An evaluation should take the good with the bad. You should see things that didn’t work this time around as opportunities to learn and do better the next time. Evaluations are the perfect opportunity to assess the quality of your work/campaign and are essential to continual improvement. •	who or what currently influences the knowledge, perceptions and behaviour of target audiences in relevant areas and/or what has influenced any changes in their knowledge, perceptions and behaviour since last evaluated. For Run for a Safe Climate, we were able to identify areas where we needed to invest more resources and have a clear idea how to approach the campaign for the next run. For example, we identified the difference it makes having a dedicated social media team member on the road with the team with direct access to local scientists and organisations plus a live presence at events. This is something more and more campaigns and organisations will have to come to terms with in the next 12 months, the importance of dedicated social media staff members. Over the six weeks of the campaign, we successfully raised the profile of the run to more than 900 Twitter followers. Further data analysis showed that the potential total reach via Twitter exceeded 50,000 followers, when looking at our Top 30 Twitter champions who provided countless Retweets and @mentions. It was a similar story on Facebook, where we garnered support from Cool Melbourne, Greenpeace and Green Cross fan pages which helped us reach an additional 15,000 fans on top of our 1500+ Facebook fans. An evaluation should dig deep and needs to gather information from a range of sources. It’s not just a numbers game, it’s about uncovering the real story. What parts of the campaign did the audience engage with? What did your audience think and what were they saying? What did your suppliers think and how were they supporting or not supporting you? Why did the media run or not run your story? Qualitative information is just as useful as quantitative. By reviewing all the comments, @messages and interactions across the social media channels, we’ve found that people were inspired by the emergency service workers running for a safe climate. There was also very little resistance and negativity throughout the run – a pleasant surprise considering that climate change is such a divisive topic for the Australian public. Another thing you need to do is give your evaluation process the time it deserves. Schedule it into your timeline from the beginning, and don’t rush it when the next project deadline is looming. An evaluation might take a day, a week or even longer – give it the time it deserves and make the time to talk to as many people as possible. Your overall report should have the figures to back up your success but you should also highlight the personal experiences behind the numbers. It took us several days to collate the data from Facebook, YouTube, Flickr, Twitter, Twitpic and blogs, which we then spent a considerable amount of time reviewing both individually and as a group. It was a worthwhile way to spend our time, as we now have a clear picture of the reach of the social media campaign for all involved, and are better placed to develop a comprehensive plan to help the organisation take its next steps. Not only that, we had so much positive feedback from diverse parties that can only excite us as we move forward. We mentioned the need to think about the evaluation before you begin. Think about what you will want to know at the end. It will even help you develop your plan and activities. Also when a client, whether they’re internal or external briefs you on their expectations, make them a part of your evaluation process. Finally a good evaluation should happen as soon after you finish your campaign or project; the longer you leave it, the greater the chance is you will rush through the process or skip it all together. It comes back to scheduling in time for evaluation in your initial plan and budget. Once the run reached the finish line at St Kilda Beach, we set aside time to breakdown each stage of the campaign. The whole social media team got together and identified highlights, challenges, wins and lesson learned. Coupled with the data collected, we were able to provide a useful and strategic evaluation report to our client that will help everyone involved when we attempt to circumnavigate Australia for the next Run for a Safe Climate. That is going to be a huge campaign – 17000km around the mainland coastline of Australia – imagine the number of tweets, Twitpics and Facebook entries we’ll do for that. Well that’s how we ‘C’ it! Yesterday was an important day of planning with one of our clients. Brainstorms, clear goals, wish lists and compelling key messages are all necessary if you want to set your business on a clear path to success. Strategy seems to be on lots of people’s minds this week. On justanotherPRblog, Karalee Evans talks about strategy being the most important part of a communications campaign *double thumbs up*. While many jump straight into creating ads or sending out media releases, Evans takes a different and very sensible approach – plan, plan, plan. It is sometimes difficult to get businesses to spend time and money on planning and strategy when they’re eager to see the uber-cool advertisement or crazy viral campaign that will make them squillions. But let’s be realistic, a good strategy, as Evans says, “should enable you to prove your success… [and] seeks to preempt your tactical failures”. A good strategy will also help you see where you went right and where you went wrong. What better way to help your business progress than not make the same mistake the second time around. During the planning day, we started by evaluating goals set the previous year, and were happy to discover many had been achieved; in some instances exceeding initial expectations. The day was broken into three different sessions focussed on the various arms of our client’s business. After nit picking, brainstorming and pulling this year’s plan and activities apart, we came out the other end with a clear plan of attack for each arm of their business. So how do you put this into practice for your business? Here are some simple steps we take our clients through. 6. Look at what tactics worked and which didn’t and ask yourself why? 8. Put it all into a simple step by step action plan. Once all the ideas, tactics and vision have been identified, you are on the road to having a comprehensive communications plan for the year. Not only will this serve as a perfect guide but it’s also an effective means of evaluating your progress. If you want to know more about how the c word can help you put this process into play, email planning@thecword.com.au or give us a call on +613 9676 9040. The more you plan, the more you can! OK a little wanky but its simplicity is the essence of planning. Failing to plan is merely poor business practice, whether it is for communications, product development, television shows or even a simple footy match. An athlete would never assume to win a gold medal without a nutrition and training plan, so why would it be different for anything else? There are numerous examples where lack of planning results in bad business decisions. One recent example is Starbucks’ failure to research the strong coffee culture in Australia. Their failure to plan resulted in the closure of 61 Australian stores. Tragically, the Victorian bushfires earlier this year resulted in the worst natural disaster in this country’s history. A recent Royal Commission found major flaws in planning by the CFA, where evacuation procedures were not implemented in time (or at all) to save many lives. 1. Schedule time to plan. It can be as simple as setting time aside to prepare a daily to-do list or spending a few hours with your team to brainstorm ideas and plans of action. And remember, stick to it! 2. Plan on paper so you can capture all your ideas and thoughts. Whether they are silly or grandiose (and sometimes our ideas can be completely wacky), you can always revisit them at another more appropriate time. 3. Remember when writing your plan, use dot points rather than a thesis. It should be simple step-by-step instructions so that any one in your business can implement it. 4. Establish up front what resources you have. It’s no good developing a killer plan that you don’t have the support or resources to implement. 5. It’s the perfect time to ask yourself why you’re doing certain things. Now you can outline goals, objective and targets. 6. Set time frames for your actions. You can then list your actions & to-do’s sequentially to get to your desired outcome. 7. Anticipate problems and create contingency plans. Be prepared for everything! Another cliché to remember is “Failing to plan, is planning to fail!” Yes we may sound like a personal development coach at a ‘How-To-Improve-Your-Life-&-Have-Millions-of-Twitter-Followers” seminar but on the plus side – it’s just a succinct tip you haven’t had to sit through a team-building activity to get to. Hope you all have a wonderful weekend planned. Celebrate it! The controversy surrounding The Chaser this week has been the focus of much discussion on the radio airwaves, TV screens, online and even at the c word. We watched as the twitterverse discussed the merits and demerits of the skit in question and also watched the various apologies and responses. Although we’ve seen the skit, we don’t have much to say that hasn’t already been said already (fence sitter hehehe). “The Chaser’s War on Everything is a satirical program aimed at provoking debate and providing social commentary on topical issues, current affairs and public life in general. The sketch in last night’s show called ‘Making A Realistic Wish Foundation” was a satirical sketch and black comedy. In order for an apology to be truly apologetic and not simply a token gesture it really must start with “we are sorry” or words to that affect. If you look closely at the Chaser’s apology they start off by talking about their show and building a case for the merits of what they have done and then only in the second paragraph do they launch into an apology. ABC and the Chaser took the “I’m sorry but…” approach which never really sounds like a sincere apology, does it? Another problem was they they took far too long to issue this statement. With breakfast radio & morning radio in a frenzy, the team & ABC seemed to ignore attempts for interviews and responses. What they should have done, is issue an apology first thing in the morning to be pro-active, be part of the debate and and to prevent the snowball from escalating. Silence only fuels speculation and further frenzy. In the fall of 1982, a murderer added 65 milligrams of cyanide to some Tylenol capsules on store shelves, killing seven people, including three in one family. Johnson & Johnson recalled and destroyed 31 million capsules at a cost of $100 million. The affable CEO, James Burke, appeared in television ads and at news conferences informing consumers of the company’s actions. Tamper-resistant packaging was rapidly introduced, and Tylenol sales swiftly bounced back to near pre-crisis levels. Johnson & Johnson was again struck by a similar crisis in 1986 when a New York woman died on Feb. 8 after taking cyanide-laced Tylenol capsules. Johnson & Johnson was ready. Responding swiftly and smoothly to the new crisis, it immediately and indefinitely canceled all television commercials for Tylenol, established a toll-free telephone hot-line to answer consumer questions and offered refunds or exchanges to customers who had purchased Tylenol capsules. At week’s end, when another bottle of tainted Tylenol was discovered in a store, it took only a matter of minutes for the manufacturer to issue a nationwide warning that people should not use the medication in its capsule form. Please note we’re not suggesting that the Exxon oil spill is by any means in the same league as the Chaser incident, but it merely demonstrates a lack of strategy being in place for dealing with issues that arise. So what can you do to better handle bad publicity and crisis? 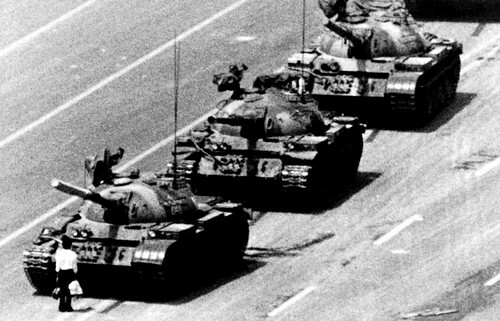 Just briefly before we speed off to enjoy the long weekend here in Melbourne … another C word in the news has been China and its dealing with the 20th anniversary of the Tiananmen Square Massacre. Twenty years on it still saddens me to no end. Our thoughts are with Tiananmen mothers who struggle to have their children’s death recognised & also those still living in exile or in prison for the efforts to topple corruption. Its a sad day indeed when many Chinese don’t even know about this terrible moment in their country’s history. I won’t leave you on a somber note though. Instead a lesson on how to say your sorry… take it away Elton. Don't you ♥ me anymore, Australian TV? It’s been an interesting week for youth in the media. We’ve had 2 very different cases that have prompted heated discussion for very different reasons. First, the chk-chk-bang chick whose name we shall not mention – her catch phrase is surely her most endearing characteristic. If the rumours are anything to go by Channel 9 head honcho’s obviously saw more in her after her ACA interview – they’ve supposedly offered her a job. What bad deed did we do to deserve you Australian television? Yet again our more interesting and intelligent public figures don’t get a look in… Kate Langbroek’s had some interesting comments about the role of intelligent women on Australian TV. There seems to be very little tolerance for it. If Chk-chk-bang gets a job, I’ll rest my case. On the other hand Chk-chk-bang did raise some serious issues about the state of journalism. With speed of delivery becoming a more important part of reporting, there is bound to be some loss of journalistic integrity. In some situations journalists are relying on tools such as wikipedia & twitter as their one & only source. This lack of fact checking from reliable sources isn’t good news as one social experiment showed. A final year sociology student Shane Fitzgerald placed a fabricated quote on Wikipedia when the French composer Maurice Jarre passed away. The quote appeared in obituaries and articles in British, Indian and Australian newspapers. The hoax remained uncovered for weeks until Fitzgerald emailed the newspapers to advise of the hoax. Many newspapers retracted the quote however it remained in tact on many other websites and newspapers. Citizen journalism is more ubiquitous than ever with tools such as the Internet, mobile phones, digital cameras and blogs giving everyone a voice. As a result, we have witnessed the Mumbai bombings unfold via Twitter, heard first hand accounts of a plane landing on the Hudson River almost immediately and even watched amateur footage of the recent Victorian bush fires. Reporting carries a degree of responsibility and as citizen journalists we need to produce factual content that can be verified by other sources. Obviously we would hope that honesty and courtesy are present in eye witness accounts – but as we’ve discovered this week this isn’t always the case. While many of us had a laugh is it right that a liar may walk away with a career. And would we be so welcoming if she did this at the stabbing of good Samaritan Luke Mitchell? Should we tolerate it? Should the police tolerate this? Obviously the police wasted time tracking down Chk-chk-bang to discovered she fabricated the entire affair. I guess we shall watch with bated breath as the story continues to unfold – or not. I’m sure someone who takes the responsibility of journalism very highly is the new editor of The Monthly. We learnt this week that The Monthly will be edited by 23 year old super genius Ben Naparstek. He doesn’t like being called a ‘wonder-kid’ or ‘boy genius’. And a quick fact check of his age reveals yes he certainly is an adult. But that doesn’t make the news any less jaw-dropping! I look forward to seeing the direction of The Monthly particularly the role of the editorial board. The most recent editor, Sally Warhaft resigned after continual disputes with the editorial board. The final straw being about who should write the introduction for last month’s cover. This is definitely a ‘watch this space’ topic. So the under-25s certainly hit the news this week. I wonder who we’ll be talking about next week. Until then have a great weekend!